When you’ve waited six years to see Mew return to your hometown, it feels almost silly to try to attribute mere words to the flood of feelings washing over you. I’m quite sure many North American fans relate strongly to this sentiment. The last time the guys played Seattle, my entire life was turned upside down, so to say I was looking forward to this is the understatement of the century. In the interim, I have discovered the amazing company of so many worldwide Frengers and people within the independent music industry, so this time around there was an extra dimension to the experience I could only have imagined back in 2009. I had originally planned to see all the shows in the Pacific Northwest (Portland, Vancouver, and Seattle), but I had to concede that I am only human and trying to do all of this would have diminished my experiences of each event, so I opted to focus on Portland and Seattle. In the end, I managed to see them five separate times over two days, leaving me with zero regrets about skipping Vancouver. 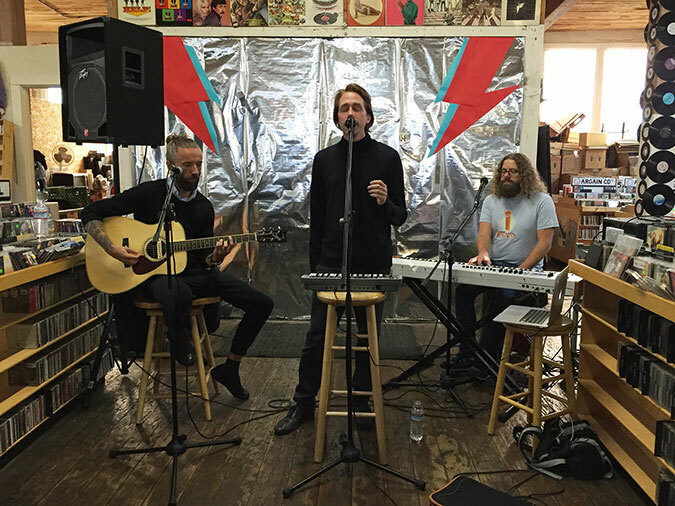 On this tour, the guys have been playing a series of in-store events at independent record shops, where they have been showcasing their acoustic versions of the more popular songs from “+ -” for small, intimate crowds in broad daylight. Having fallen desperately in love with the Quiet Sessions version of Witness, this was something I was very excited to see in-person. I first caught up with them at Music Millennium in Portland, where Jonas Bjerre, Johan Wohlert, and Nick Watts set up their gear in a balcony on the second floor, overlooking the record shop. They played their achingly beautiful, stripped-down versions of Witness, Satellites, Sometimes Life Isn’t Easy, and Water Slides. Afterwards, they held a short autograph session and meet-and-greet. I got in line with the other excited fans, and upon reaching the counter I was delighted to discover they remembered me from our last meeting, ten months ago. We shared a few jokes and I even got to practice a bit of Danish with Jonas, which was a huge deal for me as I’ve been studying the language since returning home from Copenhagen last November. Shortly thereafter I found myself inside Wonder Ballroom, at the front of stage right in between Mads Wegner and Jonas. Mew played a solid, energetic set, and I was extremely impressed with Mads’ guitar skills and ability to play their songs accurately. He has some big shoes to fill in his role as guitarist, and he is doing an absolutely fantastic job. The crowd was very enthusiastic and seemed grateful to have the guys back in town. I bought a bunch of merchandise, but didn’t linger afterwards as I had a very long drive home ahead. Two days later, Mew arrived in Seattle, my stomping grounds. 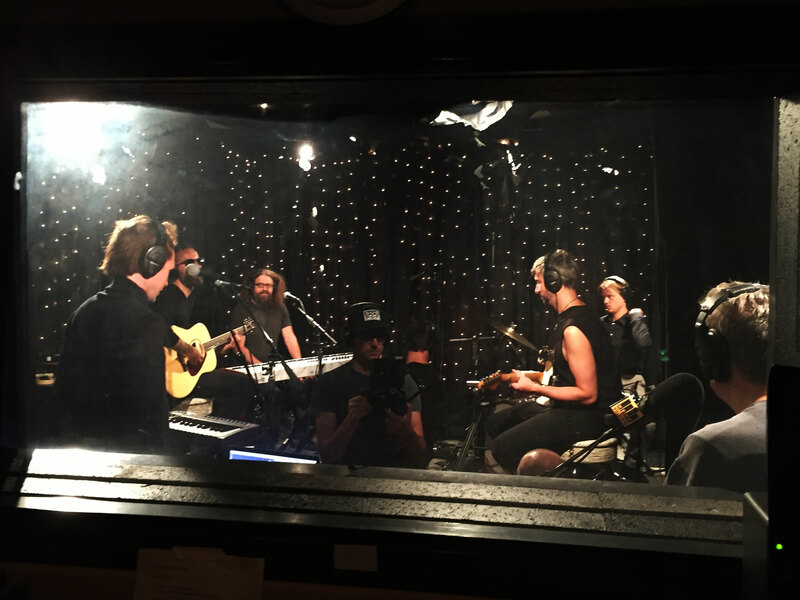 I had the privilege of beginning my day with a private viewing of their live session at KEXP 90.3 FM radio station. Their setlist was similar to the in-store sessions they’ve been doing, and it was absolutely exquisite. (As a side note, KEXP is an extremely important part of my life in Seattle, and I had the unique opportunity to be a guest DJ on the station the previous week where I played a full hour of Mew rarities. What a dream come true!) 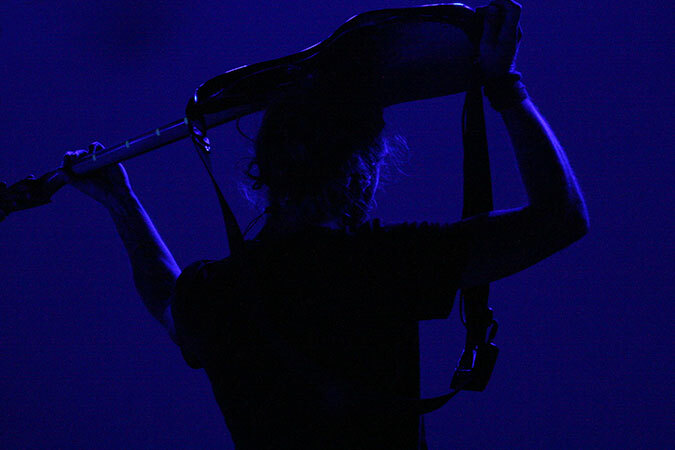 I had the chance to chat briefly with each band member, and Jonas told me he’d been running into some technical issues with the background animations at some of the gigs, but he was hoping to have them working for that evening’s show. I crossed my fingers that it would work out, because I see the animations as an essential part of the Mew live experience. That afternoon, they played an in-store set at Everyday Music, an enormous record store just down the street from Neumos, where they would be playing later that evening. I found myself surrounded by other Frengers, several people I’d known for a long time and some I just met for the first time at that moment. There is something utterly magical about being in the presence of others who feel exactly as you do about this band, and this has become one of my favorite parts of seeing them live. Another meet-and-greet session gave birth to some truly ridiculous photos, and then we were off to the venue. Neumos is my home-away-from-home in Seattle (as it is the club where most moderately popular indie bands play here) and it was the place where I had first seen Mew in 2009. The night’s show was SOLD OUT! My friends and I secured a happy Frengers bubble at stage left, in front of Johan and Silas Graae. After the Dodos opening set concluded and I saw the white screen appear at the back of the stage, I actually screamed. The animations were back! This gig was the eleventh time I’ve seen Mew live. Even taking into consideration the very first time I saw them in Seattle or their epic 22-song set in Helsinki last November, this was easily the best show I have ever seen them play. 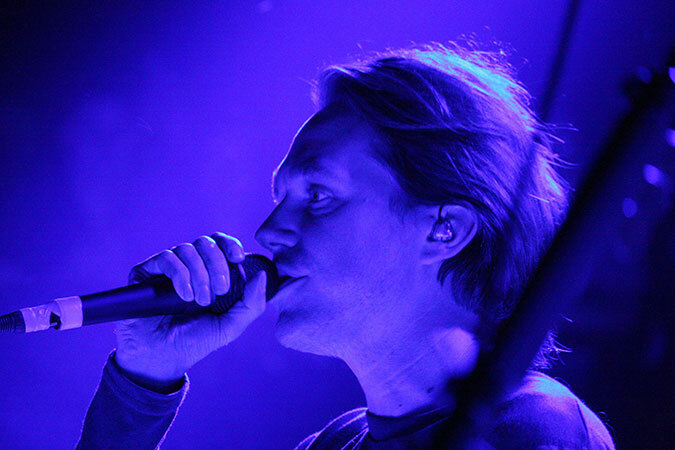 The band and the crowd were in just the right mood, and with the animated backdrops pulling me directly into the Mew world, it was exactly the experience I so desperately craved as a fan. I was grateful some of the first-timers I had brought with me could see them in the same way I had six years prior, and I know this won them some new fans. It was thrilling to see new animations for Making Friends and Rows (and holy cow, did they ever nail all 11 minutes of Rows live! What a fantastic thing to finally see in person!) Seattle absolutely adores Mew, and the feeling is mutual. Come back soon, guys! I guess I wasn’t likely the biggest fan there, as you do have a blog and you are always first to post their music to youtube. I’ll settle for second. But seriously, what a great show! I loved that they played Sometimes Life Isn’t Easy! And sure, I would have loved to hear Cross The River On Your Own, That Time On The Ledge, Mica, and Beach more than a few on the list, but it was still absolutely stunning. Brought me to tears a couple times even. I was the one wearing a No More Stories… shirt and probably staring. Not to be creepy or anything, I just don’t know many that appreciate them like I do, at least not around here.